PLEASE NOTE THAT AN ONLINE WAIVER MUST BE SIGNED IN ORDER TO BOUNCE! That's great! How many total seat belts in your vehicle? As parent/guardian I agree to indemnify the All Saints Parish, Youth Ministers, Volunteers, and the Diocese of Arlington for any costs or expenses arising out of my child’s participation in the outing described above, including the cost of any medical care given my child or any expenses or fees incurred in any lawsuit arising as a result of any damage or injuries caused by my child in the course of his or her participation in the activity. I further give my consent to that in my absence the above-named minor be admitted to any hospital or medical facility for diagnosis and treatment. I request and authorize physicians, dentists, and staff, duly licensed as Doctors of Medicine or Doctors of Dentistry or other such licensed technicians or nurses, to perform any diagnostic procedures, treatment procedures, operative procedures and x-ray treatment of the above minor. I have not been given a guarantee as to the results of examination or treatment. I authorize the hospital or medical facility to dispose of any specimen or tissue taken from the above-named minor. I authorize the All Saints Youth Ministry to use my child’s picture or video recording for educational and/or marketing purposes. Parents/guardians who do not wish their child to be photographed or filmed should so notify All Saints Youth Ministry in writing. Please sign in the box above using your mouse (or your finger if you're on a tablet). 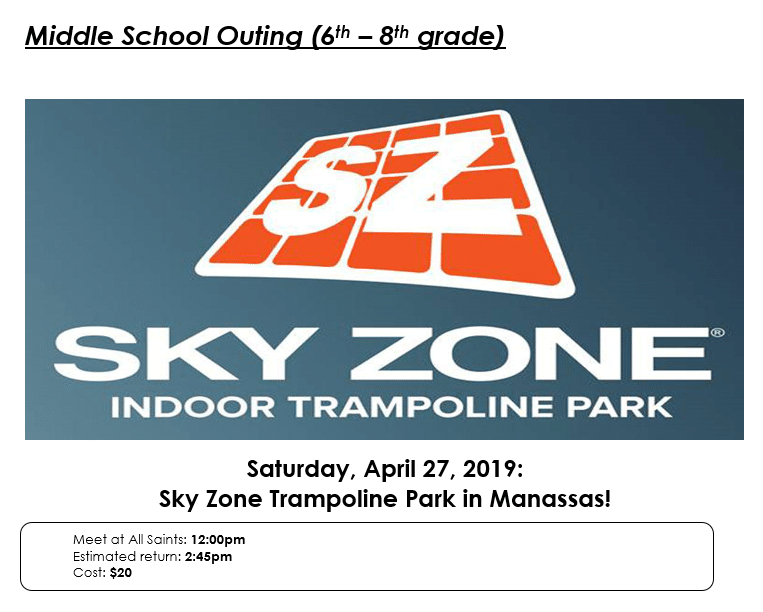 The Sky Zone facility has an additional waiver that MUST be signed *online* now for you to proceed with your registration. Please click here to complete the Sky Zone online waiver before completing your All Saints Registration. Clicking the link will open a new window so you will not lose your place in your All Saints registration.